Opel Antara/Daewoo Winstorm Maxx/Chevrolet Captiva Sport (C105). 2006–16 (prod. n/a). 5-door SUV. F/F, F/A, 1991 cm³ diesel (I4 OHC), 2231 cm³ diesel, 2384, 2405 cm³ petrol (I4 DOHC), 2994, 3195 cm³ (V6 DOHC). Joint development between Opel and Daewoo for Theta-platform SUV, making it a sister car to Daewoo Winstorm. Designed at GM Europe under Bryan Nesbitt. 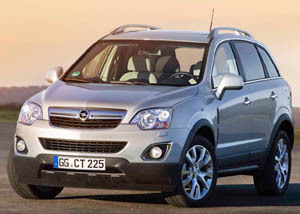 Launched first as Opel Antara, then Vauxhall Antara, in European and UK markets. Badge-engineered for Saturn as the Vue. Sold initially as premium, sporting counterpart of Winstorm in Australia and New Zealand as Holden Captiva Maxx (before being relegated to entry-level status in 2009 as Captiva 5). Took till 2008 to be sold in Korea, where they were built, as Daewoo Winstorm Maxx. Also sold in Americas as Chevrolet Captiva Sport; in Brazil as Chevrolet Captiva, without the Sport tag. Not too bad a handler, with less bulk than Winstorm, but still lacking in interior quality. Five-seater only, but still reasonable room at rear. Facelift for 2011. Last Captiva Sports sold in Colombia into 2017, though they had left the Mexican plant in 2016.